The first question I get from friends when they are coming to Jerusalem for Shabbat is, "Where is the best place to go for Kabbalat Shabbat (Friday night services)". 'Best' can be subjective, but usually they mean somewhere with a lot of singing and other people around their age. The following is a go-to list of options I usually provide to them. They all tend to be more on the spiritual side - with lots of singing and a warm atmosphere. Feel free to leave suggestions for other shuls in the comments. Kol Rina 22 Rechov Be'er Sheva, is known for being the 'bomb shelter minyan'. The shul is actually completely underground in, you guessed it, a bomb shelter. The community is very diverse - on any given Friday night you will find men in streimels, black hats, and knitted kippot. The women's side is also filled with women from across the religious spectrum - from women in wigs and stockings to those in pants. They all have something in common: a love for the welcoming mood and soulful tunes. It's a 'Carlebach Minyan' - meaning they are singing almost everything in Kabbalat Shabbat to well-known tunes. The Raz Minyan is so-called because it's lead by Rabbi Raz Hartman. You can find it on Rechov Aryeh Levine in Nachlaot - up some stairs. All you have to do is follow the crowd streaming in dressed in white, or if you arrive late just listen for the signing. You never know what tune the Rabbi is going to lead for each of the different songs - I've heard that sometimes he just makes them up. Anyone who has gone there with me has been blown away by how meaningful the davening (prayer service) is, even my friends who aren't religious. The space is small, so there is often an overflow crowd out onto the walkway and down the stairs - you know that means it's good! Another yeshiva with a strong community presence for Shabbat davening is Mayanot, located at 28 Narkis in Nachlaot. The shul is Chabad, meaning even if you sleep in Shabbat morning, you're still likely to be able to catch the Torah reading here, while most other shuls in Israel are already on to the kiddush. They also have lots of events all year, such as a big Megillah reading for Purim. Yakar, Ha-Lamed Hei 10 in Katamon, has two minyans, head to the one upstairs for the younger scene. I love going to Yakar because they sing every. single. word. in Kabbalat Shabbat. It's great for people who aren't so familiar with the services because the singing is slow enough to make it easy to follow along. 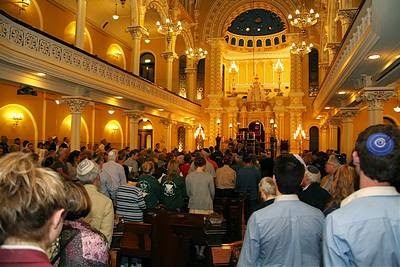 It's more than just a shul, it's a community, with regular learning opportunities, and a sister shul in Tel Aviv. Emet v'Emuna, 1 Narkis in Rechavia. It is the oldest shul in Rechavia, with a warm congregation. The rabbi, Harav Binyamin Monk, runs a school for "chazanut" (the Chazan leads the congregation in davening, so chazanut is the study of being a chazan), which is why you will find a choir there (the only other shul in Jerusalem that has that is the Great Synogague), and you will hear different melodic styles from Carlebach to Modzitch. As a bonus for history buffs, David Ben Gurion was known to learn Tanach (Bible) there. If you would like to get more information, you can contact the Gabbi, Gidon at 050-5230988.